Situated on an isolated rock commanding the Danube, Melk has been a well-known place since the Roman times. It became Austria’s first capital under Luitpold II, the Landgrave of Austria in 976AD who established his stronghold on an already existing fortification, some 60m/200ft. above the Danube. It was indeed, Luitpold III Babenberger who brought the first Benedictines to Melk in 1089. As the Babenbergers moved their main ducal residence from Melk to Tulln in 1106, their castle and all the villages and landed estates that belonged to it were given to the Benedictine monks. Luitpold III favored this monastery greatly and spared no expense on it. The folk-name of it comes to us from those days and meant roughly “at the full bushel”. Umberto Ecco‘s masterpiece, ‘The Name of the Rose‘ begins here with the description of its principal hero, Monk Edson of Melk. A disastrous fire in the year 1297 destroyed the monastery, the church and the outhouses. The catastrophe left the monastery faced with impending disintegration. The crisis was aggravated by outbreaks of the plague, poor harvests and other misfortunes. These prompted a major reform of monastic life under Abbot Seyringer in 1418. However, the Reformation of the early 16th C swept away the results of Seyringer’s reforms and in 1566 the Melk Abbey housed only three monks. The baroque age brought some of the undisputed halcyon days in the abbey’s history. Within the space of only 34 years the entire complex was rebuilt. Berthold Dietmayr (1670-1739) was appointed Abbot of Melk in 1700, when he was only thirty years of age. He set out to externalize the abbey’s importance by lending it a new exterior. The youthful Dietmayr found a kindred spirit in the master builder Jakob Prandtauer (1660-1726). The two men soon decided that, rather than merely alter the outward appearance of the abbey, they would completely reconstruct it in baroque style. The foundation stone of the new church was laid in 1702. During this period new sacred buildings and whole abbeys were being built throughout Europe. The abbots who commissioned these projects needed to be endowed with considerable financial acumen, if the costs were to be met. Abbot Berthold, known as Melk’s “builder priest”, had to find 30,000 guilders a year to finance the construction of the new abbey. That he was extremely adept at balancing the books is attested to by the fact that the ambitious project was completed. Dietmayr, the epitome of the baroque ecclesiastical dignitary, was appointed Dean of Vienna University in 1706 and served as privy counselor to three successive emperors, Leopold I, Joseph I and Karl VI. 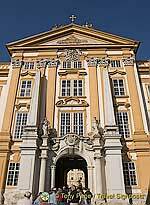 The reconstruction of Melk Abbey was the culmination of Prandtauer’s career as a master builder. He did not, however, live to see the project finished. His nephew and pupil Joseph Munggenast (1680- 1741) supervised the completion of Melk. Dietmayr contracted some of the outstanding artists of his day but also engaged the services of local craftsmen. Viennese stage designer Antonio Beduzzi was brought in to plan the interior of the church. Theatrical architect Giuseppe Galli-Bibiena was summoned for the marble altar carvings – a characteristically baroque synthesis of the metaphysical and the theatrical deriving from the contemporary conception of life as a stage of global dimensions. The painter Paul Troger, one of the foremost artistic personalities of his age, was contracted to carry out the frescos in the library and in the marble hall. The church frescos were painted by Michael Rottmayr. The reconstruction of the abbey was for the most part complete by 1736. Two years later a fire destroyed much of the new complex. Abbot Berthold, already advanced in years, immediately decreed than his life’s work should be rebuilt, but he did not live to see it finally completed. The present shape of the monastery is largely the result of the 1746 reconstruction. The southern façade alone is 362m/395yds long and divided by 59 precise axes. The principal dome is 60m/200ft. high. 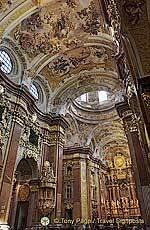 This is the largest monastery in Austria and at its time and day was the most important work of sacral Baroque in Europe. Please share your thoughts on this by posting a comment below. Tony Page is a professional writer and photographer and runs Travelsignposts with his wife Helen.